Ours equipments have been largely proven and their reliability has no comparison. For all the machinery stated below, the listing is non exhaustive and some options are available to meet your expectations. Please feel free to get in touch with us to discuss further. 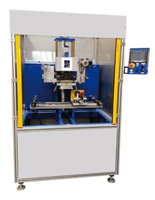 Direct acting machine are designed for small and medium size components with small printing area with a swift cycle time. 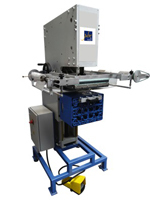 Its trust is delivered by a pneumatic cylinder. This range will give you access to larger printing format as well as the thrust for the most demanding materials. in term of tooling changing, set up time as well as speed.